An artist's depiction of a planetary system destroyed by its dying white-dwarf star. Rocky material moving inward falls onto the white dwarf's surface, revealing a limestone-rich surface. SAN DIEGO — A distant world could be rich in limestone, a rock that, on Earth, is produced by living processes. The planet's star is slowly devouring it, revealing to watching astronomers what looks like a limestone crust. On Earth, limestone has ties to living organisms, though the substance can also form without their help. "This material appears to have high carbon content," said Carl Melis at a press conference on Monday (Jun 13) at the 228th American Astronomical Society in San Diego, California. Melis, an astronomer studying dying stars known as white dwarfs at the University of California, San Diego, was part of a team that identified the remains as being from a world rich in limestone's components, carbon and calcium. "Limestone has connections to marine organisms on Earth," Melis said. "Marine organisms produce calcium carbonate, making shells. When they die, the shells sink to the bottom of the ocean, get compressed and eventually end up as limestone." At the end of their lifetimes, some stars swell up into massive giants before blowing off their atmospheres, leaving behind dense cores known as white dwarfs. The outer layers of some white dwarfs change rapidly, and material that falls into the star sinks down over a short period of time. Any heavier elements in the star, which is predominantly composed of hydrogen, come from the destroyed remains of doomed planets and asteroids in orbit. 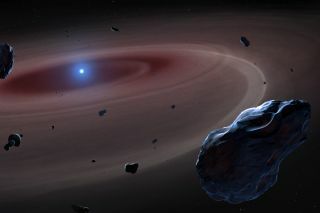 Melis and co-author Patrick Dufour, of the University of Montreal, established first that the material they were seeing in the white dwarf SDSSJ1043+0855 came from the crust of a rocky body. Their conclusions depend on the way layers are created in planets. When planets form, the heavy materials sink while the lighter stuff rises to the surface, in a process known as differentiation. By studying the material on the white dwarf with NASA's Hubble Space Telescope and the Keck Observatory telescope in Hawaii, the researchers found that the star lacked the ingredients of planetary mantles and cores, the heavy materials that sink in planets. Instead, the remains matched up well with a simulation of the outer layers of Earth, making these the components of what Melis called a "hollow Earth." In fact, the remains have some of the lowest doses of iron, which dominates planetary cores, among detected objects found polluting white dwarfs. "It makes me feel like we're looking at the surface layers of a differentiated rocky body," Melis said. Not all of the objects large enough to differentiate their layers are planets, however. Melis told Space.com that the findings were "reasonably consistent" with a moon-like object, as well. This moon could have formed around a rocky terrestrial planet, or it could have been attached to a massive gas giant and spiraled inward as the star began its end-of-life changes. If so, it would be more like Earth's moon than like Europa, the moon of Jupiter that's known for hiding a subsurface ocean beneath its icy shell. Carbon locked into ice and water on a moon like Europa would rapidly turn to gas as it encountered higher temperatures closer to a star. When it comes to nailing down where such a world could have formed, "It's a really delicate balance you've got to play," Melis said. A planet orbiting too close to its star is slowly being torn apart. A study of the stellar surface reveals carbon and calcium that could have once formed a limestone-rich crust. After confirming they were looking at a consumed rocky world, the pair of researchers then turned to the heavy doses of carbon, which suggested a surface several times as carbon-rich as Earth's. The plentiful carbon in this situation is puzzling, Melis said, because the element usually winds up frozen as solid ice or filling the planet's atmosphere as a gas. When an expanding sun at the end of its life cooks the planet, that sort of carbon should evaporate into the atmosphere. "You need to lock [the carbon] up somehow into the surface of a planet to keep it," Melis said. By modeling combinations of the detected elements, the scientists determined that high doses of limestone could have existed on the surface of the planet. As much as 9 percent of the planet's crust could have been made of limestone, which, as part of the surface, could survive the rising temperatures, the researchers found. Most of Earth's limestone forms thanks to living things. As shells, coral and algae pile up in calm, shallow water, they gradually cement into rock. So if limestone is present on the surface of another world, it could mean that life had a hand in the substance's formation. In fact, Melis suggested that the first evidence of life might come not as a hovering spacecraft or an alien megastructure but in a simpler, subtler form that might not be recognized at first glance. But he was quick to caution that limestone itself isn't automatically a sign of life. Though biological processes dominate Earth's limestone formation, chemical processes also play a minor role. Some limestone forms through interactions with water and calcium carbonate. Evaporation also plays a role, as water-carrying calcium carbonates can leave behind minerals that form stalactites and stalagmites inside of caves. Nor does the evidence prove that carbon and calcium combined to form limestone as opposed to something else on the slowly shredded planet, although the simulations suggest it, the researchers said. When the James Webb Space Telescope is launched in 2018, it will be able to search the disk of debris around the star for traces of limestone. "If we see calcium carbonate in that dust, we have to know it's there," Melis said.